With Dynamic Data, you can populate a field(s) with values looked up from an alternate datasource. This is especially useful when you need to populate a large number of values (as in a Drop-down Menu), or when the values that return from the table change according to other selections on the form. Use the MultiField Population option of Dynamic Data to lookup a record and load all of its data into a set of fields on the form. You can also populate multiple fields with the returned data. 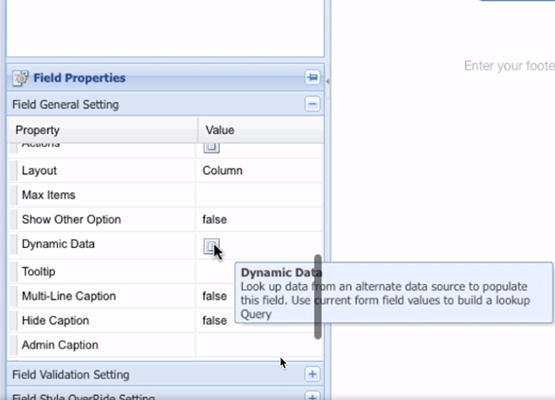 Watch this video to learn more and see some tutorial examples, then read below to learn how to configure dynamic data for your form. Make a choice from the Lookup Form / Table drop-down menu. instead choose Edit Query to configure a rule that will control which data is returned based on selections made on the form or static lookup values. Click Next to configure more options. Check the Alternate Data Values box to choose a alternate field/column to use for the data value. The display value is the value shown to the user (e.g., [Event Name]) and the data value is the value that gets recorded in the database (e.g., [eventID]). If you do not choose an alternate data value, then the display value is used and recorded with the submission. Check the Return Bind Values box to choose an alternate column/field from the lookup table to populate the bind value property. The bind value property is typically used in bindings and calculations. For example, your dynamic lookup may return available tickets for an event. You may opt to return the [Price] field as the bind value so you can use it easily in a calculation. You can also populate other fields on the form with lookup values that correspond to the value chosen in this element. For MultiField Population, click the Settings button to open a window in which you may choose a Dynamic Data Field and corresponding Destination Form Field. Click Next to move on to the Sort Order step. Choose which fields you want to sort on, and then select Descending or Ascending order. Click Finish to commit the changes, then preview the form to see the data populate the element. When using the Select Distinct option, the Display Value must be a single field (not a concatenated string) or, alternatively, you can enable the alternate data value and select the field you would like to use in the select Distinct filtering operation.